Sunday, November 8 marks the 120th anniversary of one of the greatest moments in the history of science: an obscure German physics professor’s discovery of the X-ray. 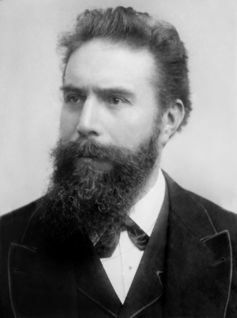 His name was Wilhelm Roentgen, and in the six weeks that followed, he devoted nearly every waking hour to exploring the properties of the new rays before announcing his discovery to the world. Within just months, scientists worldwide were experimenting with the newly discovered rays. Roentgen’s discovery and its subsequent revolutionary impact represent one of science’s greatest stories. Portrait of Wilhelm Roentgen via www.shutterstock.com. Roentgen’s discovery opened a window on the previously invisible interior of the human body and spawned the existence of an entirely new medical specialty, radiology. As a practicing radiologist, I’ve been amazed to see how x-rays have changed our views of ourselves and our world – so much so that I even wrote book about it, X-ray Vision. The story is vast, but some of its key features can be summarized here. Born in Germany in 1845, Roentgen had a somewhat lackluster career as a student, but he eventually earned a PhD and took at position at the University of Wurzburg. There he investigated the effects of passing electrical currents through vacuum tubes. On a fateful day in November 1895, he observed that, despite the presence of a cardboard barrier, emissions from a tube caused a nearby screen to fluoresce (glow). Said Roentgen, “I did not think. I investigated.” Soon he hypothesized that the tube was emitting a new kind of ray, invisible to the eye, which could penetrate solid objects. 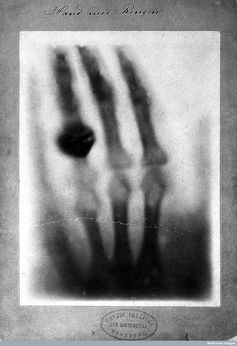 Borrowing the physicist’s traditional term for the unknown, X, Roentgen dubbed the new form of radiation “X-rays.” Within two weeks of his discovery, he produced the first X-ray image of a human being, showing the bones of his wife Bertha’s ringed hand. So unexpected was his discovery that when he published his initial paper on the properties of the new ray, the most renowned physicist in the world, Lord Kelvin, after whom one of the best-known temperature scales is named, pronounced the new rays a hoax. Of course, scientists around the world soon discovered otherwise. Thanks to his discovery, Roentgen received numerous accolades, including the very first Nobel Prize in Physics in 1901. Despite the urging of friends and colleagues who wanted him to grow rich from his discovery, Roentgen refused to file a patent application and even donated the entire monetary component of his Nobel Prize (the equivalent today of US$1.2 million) to his university. He firmly believed that such discoveries are the property of all mankind. When Roentgen died in 1923, he had fallen into penury, his savings consumed by post-World War I inflation. X-rays themselves are a form of electromagnetic radiation, composed of the same photons as visible light, microwaves, and radio waves, only vibrating at much shorter wavelengths and much higher frequencies. This enables them to penetrate solid objects, such as wood, clothing and human tissues. When a medical X-ray image is created, an X-ray beam passes through the patient and is picked up by a detector on the other side. Portions of the beam are absorbed, but others pass all the way through, and the “shadows” cast by different tissues create the image. X-rays have revolutionized our view of the world. They cast light on the previously invisible realm of the very small through X-ray crystallography. This technique for imaging molecular structures was pioneered by the father-son team of William H and William L Bragg, who shared the 1915 Nobel Prize in Physics. Decades later, X-ray crystallography provided the images James Watson and Francis Crick used to deduce the double-helix structure of DNA. X-rays have also been used to reveal structure of the universe itself. X-ray astronomy was impossible until the 1960s, because nearly all extraterrestrial X-rays are absorbed by the Earth’s atmosphere. But thanks to rocket- and satellite-mounted detectors, astronomers began detecting high-energy X-ray emissions from long-visible stars and galaxies, as well as previously unknown and truly bizarre objects such as neutron stars and black holes, which have densities more than trillions of times that of the sun. But perhaps the most notable of all objects revealed by X-rays has been the human body itself. Almost immediately after the discovery of the new rays, scientists and physicians began using them to peer inside the body without cutting it open, revealing not only normal structures but also fractures, pneumonias and even foreign objects, such as swallowed coins. US President James Garfield died in 1881 largely because his doctors could not locate an assassin’s bullet in his body, while a century later, X-rays revealed the bullet in President Ronald Reagan’s chest in minutes, helping to save his life. CT scans are a critical part of diagnosis. CT scan of upper abdomen via www.shutterstock.com. Newer medical imaging techniques such as CT scanning rely on Roentgen’s discovery, but instead of sending X-rays through the patient’s body from one direction only, beams are directed from many different angles, making it possible to create a much sharper two-dimensional image of the body’s interior. 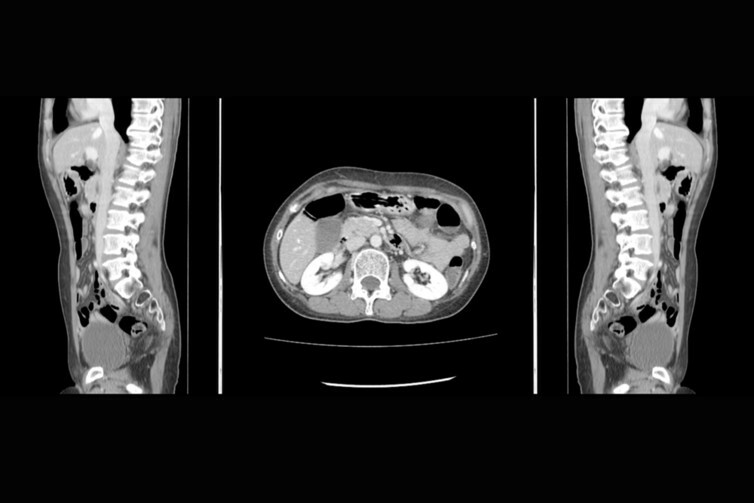 CT scans now play a huge role in medical diagnosis. One recent study in a major emergency department showed that after a CT scan of the chest, the treating doctor’s leading diagnosis changes 42% of the time, and after a CT scan of the abdomen it changes 51% of the time. This is testament to the huge impact of X-ray technology on how medicine is practiced, sparing many patients unnecessary surgery and getting urgent treatment to others faster than would otherwise be possible. When leading internists in the US were challenged to name the medical innovations without which it would be most difficult to imagine practicing medicine, CT scanning received the greatest number of votes by far. Thanks to CT’s wide availability and great speed, doctors can determine within minutes whether or not a patient’s abdominal pain is due to appendicitis, chest pain reflects a tear in the aorta, or a severe headache is due to the rupture of a blood vessel in the brain. It is no wonder that about 80 million CT scans are performed each year in the US. Of course, the use of X-rays in medicine extends beyond diagnosis. In the years immediately following Roentgen’s discovery, some investigators discovered that the same X-rays used to detect cancers in organs such as the lung and breast could also aid in treating such tumors, by damaging the DNA of cancerous cells. Today, radiation oncology is a distinct medical specialty, often called upon to help kill residual cancer cells after a tumor is surgically removed. It also plays an important role in palliative medicine, enabling physicians to relieve pain by shrinking inoperable tumors. Thanks to Roentgen’s invisible light, we now operate with a much deeper understanding of the universe we inhabit, the molecules and cells of which we are composed and the diseases that threaten our lives. Roentgen himself would no doubt be astounded by the novel purposes to which X-rays have been adapted in the decades since his death. Yet he would also remind us that, over the next 120 years, many new X-ray discoveries almost certainly remain to be made.